In the comments and on Twitter recently has been some discussion about what would a Crosstown Light Rail line look like, while I think we have a lot on our plate, there isn’t any harm in looking at how it could fit in. A strategic level crosstown public transport route isn’t a new idea. It’s been appearing on maps for a while now such as this rapid transit map on Auckland Transport’s website and even in ATAP (below). In both cases this shows a route from New Lynn to Onehunga and is assumed to be a bus, but the details are fairly vague. After a rather large think, I came up with an option that I feel provides many benefits while keeping costs low and utilising assets we have, or are about to build. In essence, it involves using and extending the light rail that is already intended to be built as part of the airport project and extending that along the Avondale-Southdown line. Starting at Avondale, an upgrade to the train station would put light rail alongside, perhaps not to dissimilar to what’s been built at Helensvale on the Gold Coast (biggest version of the image I could find sorry). The line would follow the Western Line, passing under Blockhouse Bay Rd using the spare span that already exists as part of the bridge. It would then use the Avondale-Southdown designation, crossing New North Rd on either a new signalised intersection or a more expensive grade separated crossing. From there it would be relatively easy work using the existing rail designation and then connecting to the proposed Light Rail to the Airport route near the Dominion Rd interchange. Like with the old idea of a heavy rail spur to Mt Roskill, there is the option for one or two stations along the route before it gets to Dominion Rd. After that, services would use the already planned route to get to Onehunga and possibly beyond. All up, the line would be about 4.4km and much of it would be in an existing rail designation and relatively easy to build. Furthermore, the line would be nearly completely grade separated and services to Onehunga would be able to utilise infrastructure we already intend to build. The line would use the same rolling stock and depot as the other proposed Light Rail lines. All of this would make it not only very fast, but also relatively cheap to build, all while leaving east/west arterial streets for local buses and cycling. It would link the Western, and Southwestern lines as well as a few major bus routes. The Dominion Rd to Onehugna corridor, being completely off-line, is likely to have additional capacity compared to the Dominion Rd section. This would mean there is plenty of capacity to run these east-west services. Most likely they would run from Avondale to Onehugna but could potentially run all the way to the airport too. The sections through parks such as Hendon also are unlikely to destroy amenity or create large severance as we could consider using green tracks for these sections allowing us to delicately integrate transport and space. One possible next step would be extending the line to New Lynn, connecting it with the growing Metro Centre there. That would also allow an interchange with the hub of the Western bus network meaning much more potential two-seat west-south journeys. This would likely be along Gt North Rd but there would be difficulty in crossing over the western line. Another extension we could think about is taking the line to Penrose to allow for an interchange with the Southern Line. This could be by re-purposing the existing Onehunga Line to Light Rail. The Onehunga line will likely pose a problem in the future it is going to be frustrating to double track meaning lower frequency, it also slows down southern services due to the flat junction. A more frequent service connecting to Penrose may end up being a better service to users of the current line than the current heavy rail service, the line could also easily add an additional Mt Smart stop closer to the stadium. This line could also in future take pressure off the CRL as it would be over 10 minutes faster for West/South trips. This would free up future CRL capacity for other passengers, because let’s be honest the CRL will get busy. We could create even greater crosstown options in the future with some further extensions. After getting light rail over the existing rail lines at Penrose, it could be sent down Penrose Road to turn connect to either Sylvia Park or Panmure stations. Penrose Rd would likely need some widening in many sections and this would likely be much more expensive than previous stages. Sylvia Park would be cheaper to connect to an allow an additional strategic PT connection to the Metro Centre there plus the station, however, Panmure would allow connection with the hub of the Eastern New Network as well as the Eastern Line. The would be an additional advantage from being able to connect through to the proposed Northwest LRT line. There are a few options here but I am not sure if they make much sense for the foreseeable future due to the expense and lack of clear routes. Is relatively low cost heavily utilising proposed infrastructure, as well as cheap greenfield or protected corridor. We do need to be careful of mode bias and using the right tool for the right job. Rail is not always going to be the best option, however, in this case, due to the unique circumstances of the Avondale-Southdown corridor and the proposed building of Light Rail from Dominion Rd interchange to the Airport, a Crosstown Light Rail line could actually be a feasible alternative to a rapid bus line as listed in documents like ATAP and even our own Congestion Free Network 2. I would welcome this eagerly. I live in west and work in Mt Wellington. To catch PT currently to make here on time for 7:30am start I have to wake at 5am, walk 30min to train station, get off at Newmarket, catch another southern train to Ellerslie, jump off there and catch a bus down Gt South Rd and finally, get off and walk down Sylvia Park Rd. Going back home is a different beast with all the traffic around at 4pm. Why live out West and work in Mt. Wellington, then complain about PT problems? The obvious solution is to change your accommodation or your job. That would happen a lot quicker than waiting for new PT initiatives. While for some people, working and living close proximity may be a good thing, but for others, being reminded of work is the last thing you need when not at work, so living on the other side of town makes perfect sense. Luke has every right to voice his frustration at some such a complicated commute. PT and cycleways only improve because people like Luke advocate for them through portals such as this one. Thank God the rental crisis has been solved and cheap rentals are plentiful and letting fees are low. Otherwise this would come off as one of those elite projection thingies. +1 Also you’d be pretty hard-pressed to up-sticks the whole family (including children settled at school) each time you take another insecure job. I’m all for live/work/play in the same place, but job security doesn’t allow it for many. It’s not just job security either, many people change jobs out of choice. Ah, but where you have job choice, your carbon footprint needs to be a factor in the decision. And working locally has many knock-on effects in building community and social health. So Mike Lowe’s comment isn’t lost on me. It was just ill-timed because Luke was being positive about this proposal rather than setting out to whinge about PT. I live out west because we were lucky enough to buy just before the boom in the property market. I work in Mt Wellington because I have a great job that have given me opportunities to progress in my chosen field. If any of the options you suggested pop up I would consider them but they are available at present. Much respect for your dedication to public transport and your legs. We need more people like yourself in this city! Cycle may be an option for you? Just the last bit may need to cycle on the path! First 30 mins walk would be a lot quicker for starters, whole way cycle or cycle train combo being that early train shouldn’t be full. What suburb are you in? I am considering a bike, at the very least to the train station and back which would save some time (extra sleep perhaps?) and yes, I feel the footpath would be a safer option down Gt South Rd. I’m in Glen Eden. Can you drive? Why don’t you just drive? Surely even with the traffic it won’t take 2.5 hours to drive from Avondale to Mt Wellington? And I respect that. But in the grander scheme of things the world will be gone one day whether or not Luke chooses to take PT to work or take a car. I think the benefits of taking car outweigh the amount of pollution he creates. Can drive and do so some days. Issue is we are down to 1 car at present. Have to share it I’m afraid. With a car it only takes 45 min to get to work and roughly the same home depending on the day. It looks like it takes about 1hr 40 mins walk/PT commute not 2.5 hrs, 5am is his wake up time. It’s lucky a 321 hospital bus times quite nicely to take him from Ellerslie to near Sylvia Park Rd as they aren’t that often. Luke could actually get off at Penrose (to get a longer train ride) & transfer there to bus especially now they have a crossing from the station to the bus stop but less sheltered walk & horribly noisy stop that one with all the heavy traffic rumbling past it (& you would be waiting longer for it too!). One hour 40 is still an unreasonably long time. This cross route of Harriet’s looks promising – perhaps we could test the idea with a bus service along the same route to find out whether the demand for cross-town public transport exists or not? It’s good to be innovative and flexible, and to make the public transport network usable by everyone to go everywhere, not just into and out of the CBD. A six-month pilot should do the trick! AUCKAND TRAFFIC PROBLEMS SOLVED: HEY EVERYONE, JUST LIVE NEXT TO YOUR WORK! A sensible proposition. Avondale train station will have to be redeveloped as part of the work required to grade separate the NAL at St Jude Street. Unfortunately use of the second arch on the Blockhouse Bay Road rail bridge is constricted by the fact that the partial lowering of the existing rail track in 2009 introduced a whole pile of reinforcing into it meaning it will probably have to be re-constructed, particularly if you grade separate the LR track where it crosses New North Road, which seems essential given its arterial status and the fact that you’ll want decent frequencies on the new LR line. You’d also probably want to introduce bus connections into Avondale station, which might be a bit of a squeeze, particularly since the Whau shared path is planned to use the same corridor. I don’t see why you would need to grade separate New North Road. It already gets a red light every 120 seconds every few hundred metres, so putting a train across every five minutes won’t even register. I mean, we’re currently happy to hold all NNR traffic to let people turn into a supermarket carpark, so having light rail run across a road isn’t much to ask. I am personally not to particular about the type of rail that occupies this corridor, although if the green areas are going to look like the picture with light rail, that sways me a little, quite lovely. To remedy the freight problems from Northport, perhaps we could stop buying so much stuff? Certainly with improving public transport links and cycle ways we will be reducing the perceived need for cars, which are a large factor in freight. Like most projects in this network the time frame is the most frustrating part, why are roads still built so much more quickly than rail? I wondered when you would bring up conversion of the Onehunga line to light rail since seeing the picture you used of the Mangere crossing, clearly showing light rail heading off toward Penrose as well. Interesting idea, and if it went ahead, you could possibly extend the line from Penrose to Ellerslie, thus creating Botany to New Lynn (or Avondale) light rail. But, as previously mentioned, KiwiRail have made clear that the SAL designation will not be permitted to be taken for any other use than what is intended, so it’s really a moot point. That’s not quite right Geoff. Kiwirail have, quite rightly, demanded that sufficient width in the existing designation remain for the future possibilities (or a replacement designation be created) . The difference is that the SAL designation is quite broad (around 20m or more) and in most parts can accommodate both a freight track and passenger transit. Twin track light rail needs less than half the width of the existing designation, before you even talk about the adjacent reserve. Or to put it another way, Kiwirail would be perfectly happy to sell off part of their designation that they don’t need. This is surely a no-brainer, not only in and of itself, but also as THE vital link which would do more than any other to create the kind of “network effect” that Auckland needs to develop a truly useful “rapid” transport service. I’d suggest a slight modification to what Harriet proposes – a line commencing at Pt Chevalier for connections to the NW line, then to Mt Albert along Carrington Road, and down to the Avondale-Southdown alignment. After connecting into the “existing” Roskill-Onehunga section, converting the Onehunga Line to LR and taking it to Penrose. From there, there are several options, including (1) Penrose Road as Harriet suggests (but needing considerable road widening), (2) Great South Road and up the SE Highway alignment (may involve less property purchase and road widening), and (3) a short way up Penrose Road and along the Southern Motorway alignment (may need elevated sections). 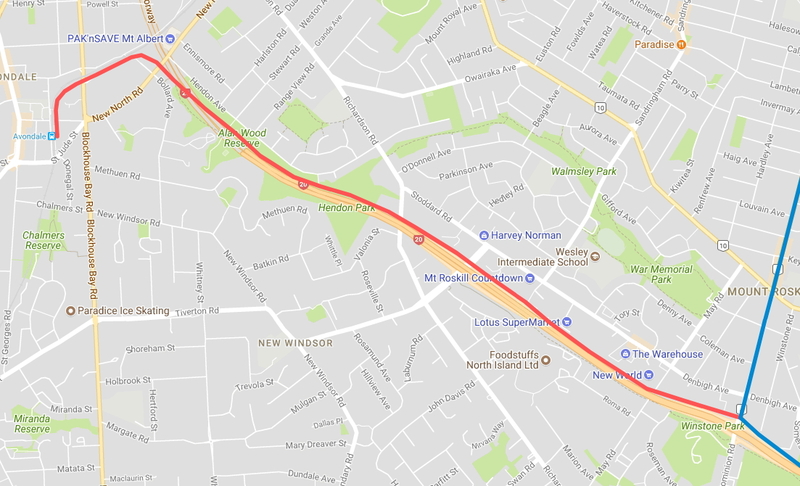 I favour Option (2) because it not only connects into the Eastern Line at Sylvia Park but also could be extended along the same line to Pakuranga, connecting into the AMETI busway. The impact of such a line would be to connect almost all Auckland’s “rapid” lines together. It would intersect the NW line at Pt Chevalier, the Western Line at Mt Albert, the Southwestern Line at Roskill-Onehunga, the Southern Line at Penrose, the Eastern Line at Sylvia Park and the “Botany Line busway” at Pakuranga. This level of connectivity on the network would surely be a true game-changer in getting people onto PT, especially for non-CBD oriented journeys. Hopefully AT will also bite the bullet and develop a proper nomenclature for the “rapid” services. It has made a desultory gesture in that direction by signposting various Western Line stations as being on line “W”, but without expanding it beyond that and without promoting the nomenclature. I like the idea of “taking the Rapid” along the A Line (Albany-Airport), the W Line (as above), the S Line (South/East loop), the B Line (Botany-Airport), the “E Line” (Panmure-Botany), or the “K Line” (northwestern, to Kumeu . . . ?) etc etc as well as the “C Line” (Crosstown). Even the “D Line” for the Devonport ferry. Once people start thinking of the rapid bus services, train services and key ferries as being part of the same unified rapid network, PT will start to “feel” more normal as a way of getting from anywhere to anywhere else. Agreed the key is for there to be a proper rapid network – the fact it doesn’t exist yet is the biggest hurdle for LRT buy-in – people can see the Busway and know that works. They can’t see LRT yet. Although I am reluctant about the route for the NW LRT route going through too many of the inner West suburbs – there’s not going to be much point in a NW service if it meanders through too many suburbs – it should be as direct possible. Think this blog and others are pretty much thinking the fast version of the NW line. With the big u-turn announced by Grant Robertson this morning, there might not be much money sloshing around for all these grandiose projects. It was a u-turn in rhetoric not policy so I can’t see it having much impact on anything. While I agree it was hypocritical, it is pretty standard when a politician moves from opposition to government. As opposition leader John Key described Working for Families as communism by stealth, yet it was still largely in place when he stepped down as Prime Minister eight years later. I am planning on asking that the Avondale Rail designation be given heritage protection once it is 100 years old. It would be a shame if someone came along and actually built anything within it and destroyed this wonderful strip of undeveloped wasteland. You sure are on a roll lately, lol. or is that a troll roll. Our first forays into LR as they are initially built. No further improvement allowed? Maybe also a length of disconnected cycleway, complete with bus stops, drains and door zones. And the Outer LInk Mt Eden detour could be a tourist attraction, with a game onboard to guess the average, and the longest, time it took a bus to get from Manukau Rd to St Lukes? For Bob, we could keep the Birkenhead buses unchanged in their livery, forever. And maybe we should keep a section of, say, Constellation Drive, and Great North Rd at Waterview and Symonds St, with their current road markings just to show how once upon a time, people were ranked a distant second to the car. No you should only protect things that are special examples of their type. I am thinking the Dominion Rd New North Road interchange. Pretty sure we have plenty of grossly overblown interchanges! Perhaps we need to remove the nippon clippons and return the HB to its original glory? It is also worth noting that yesterday Foodstuffs announced they will be moving out of their Mt Roskill headquarters in three years time, leaving behind a 15 hectare brownfield development site directly on the proposed Avondale – Onehunga corridor. Hey good room for a stabling facility, combined maybe with some bus depot too if needed. I see will be moved to The Landing Precinct near the airport, all the more reason need that LRT to airport for the extra 1000 workers & extra logistics traffic! MInd you near Dominion Rd currently so helpful either way to have the LRT proposed by this post or even the plain Dominion Rd one. Better used for residential and commercial I reckon. How many apartments can you squeeze into 15 hectares? Assume 1/3 land utilization = 50,000 m2. Darn, need my morning coffee, this is on the wrong side of the motorway for stabling I guess. Overall, I agree this sounds good Harriet. I think crosstown rapid transit is a fantastic idea, but I’m less convinced that using the Avondale-Southdown designation for light rail is wise. As you say, there’s a lot of work needed on the NAL before freight volumes will justify building Avondale-Southdown, but climate change demands massive decarbonisation of the transport sector – we need to get much more freight off the roads and on to rail, so we need to get on with the necessary improvements sooner rather than later to make that possible. My other reason for not wanting to block off the option for cross-town heavy rail is that the CRL is going to reach capacity probably sooner than we expect. There’s already a reasonable amount of west-south demand and hopefully within a decade we’ll have regional rapid rail also driving that demand, so I think it’d be useful to be able to run a crosstown pattern to serve that demand and take some pressure off the CRL and Newmarket. Both of these are probably decades away, but once the designation’s gone, it’s gone, and I think we’d eventually regret not having the option for creating more links on the heavy rail network. 1. Newmarket won’t be that constrained as the CRL running patterns could be very simple & frequent without a special crosstown HR pattern. Regional rail could just stop at Britomart after Otahuhu. 2. Which is easier/cheaper: Upgrading Newmarket junction and such or a whole new HR line to avoid it? 3. Improved shipping links may be the best solution, do we really want too much freight coming through at night or in between passenger services even west of Avondale? This would solve a lot of traffic woes for much of the isthmus. There’s a large amount of west-east travel and many commuters have no sub-90 minute PT options. Bring on Stage 1! I have a few ideas that I posted previously in another post last year for cross-town light rail. If you search LGOIMA on this blog site and scroll down to my name in the comments and see what people think? Admin – Can you guys link the pictures to a new post or something? 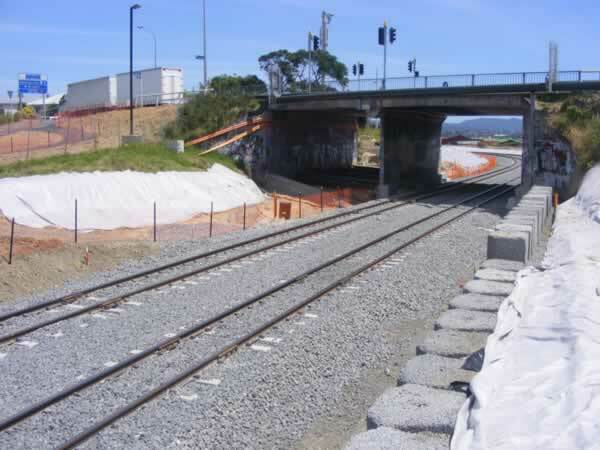 Never ever suggest to remove rail from Onehunga again. We will fight you every bit of the way if you want to remove the train. No one is suggesting to remove rail. The suggestion is to *upgrade* the rail system through Onehunga with two new lines. I like that you chose a picture from my hometown for the top image – Freiburg, Germany with tram line 1 to Littenweiler. What freight? A little understood effect of completing the rail to Northport, finally, is that even less freight will travel south from Northland through Akl, it will instead be heading to port up north. And building this is in the Lab/NZF coalition agreement. There will not be a heavy rail line built on this designation. Anyway they’ve already built a m’way on it, the idea that KR can veto another transport use here is nonsense. The Southdown Avondale Line is protected for double track heavy rail, it was confirmed last week by Winston Peters. Light Rail will need to find its own space, either by widening the corridor to allow for four tracks, or re-routing through Three Kings (not a bad idea, after all the light rail line is upposed to be linking communities, not bypassing them). It was confirmed by Winston Peters at a public meeting last week that no part of the Southdown-Avondale railway corridor will be used for light rail.